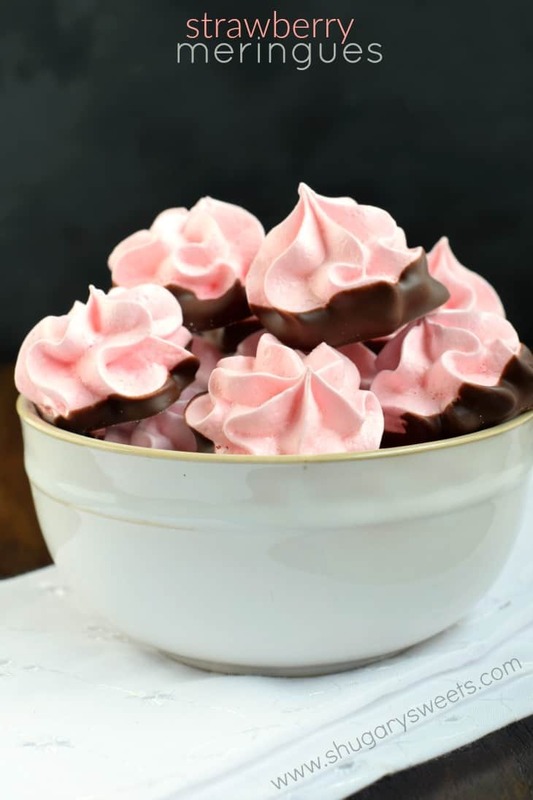 Delicious, festive, easy, melt in your mouth Strawberry Meringues dipped in chocolate! 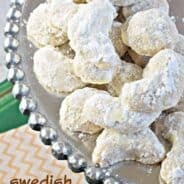 My favorite cookie recipe! I love movies. I love going to the movies. I love the popcorn I get at the movies. I can see a dumb movie and still have a great time, because I love the experience. But you know what drives me crazy? All the award shows. Actors and actresses make more money than the average person. Clearly. Let’s set up an example. Seriously, my point is this. Do away with the awards please. Your award is the fact that you make so much money and your movie was a hit at the box office. Do we really need to see these people dressed up in clothes we can’t afford, giving speeches that make us want to barf, and talking about the free swag that costs more than my home? Okay, I’m a little bitter, haha. Let’s give an award instead for this….Strawberry Meringues. These are melt in your mouth delicious. The sweet strawberry meringue is finished with decadent, dark chocolate! Of course, I used my favorite Ghirardelli dark melting wafers. They are so smooth, and they melt perfectly EVERY. SINGLE. TIME. Well, if you’re going to have to watch an awards show, I suggest you at least have the perfect treat! Bake them at a low temperature for a long time. I usually do 200 degrees for 90 minutes. 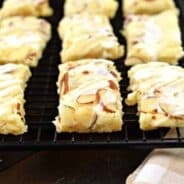 Use parchment paper! Easy to clean up, and mine never get browned bottoms. Once done baking, turn oven off and let them set in the oven for hours. I usually make them in the evening, then let them sit in the oven overnight. Don’t bake on a humid day. Don’t store them when it’s humid in your house. Use JELL-O gelatin powder to add color and flavor (I usually add in a couple tablespoons of the powder). If using food coloring, add it before beating to stiff peaks. It helps distribute it more evenly. I also find gel food coloring works better than liquid. Use a pastry bag and tip for swirls and roses. Or use a spoon and drop by tablespoon onto parchment paper. You decide. These festive 4th of July Meringue Cookies are so fun and easy to make! You’ll love the bright colors, perfect for any patriotic holiday! 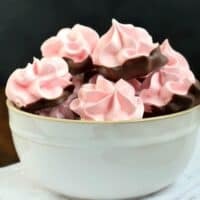 One of my favorite flavor combinations ever: Chocolate Mint Meringue cookies are so easy to make, and so versatile too! Root Beer Float Meringue Cookies are filled with the classic taste of summer, in a sweet cookie! Chewy, crunchy, these will go fast at your next BBQ. I’ve got a quick video showing just how easy it is to make these Strawberry Meringues! 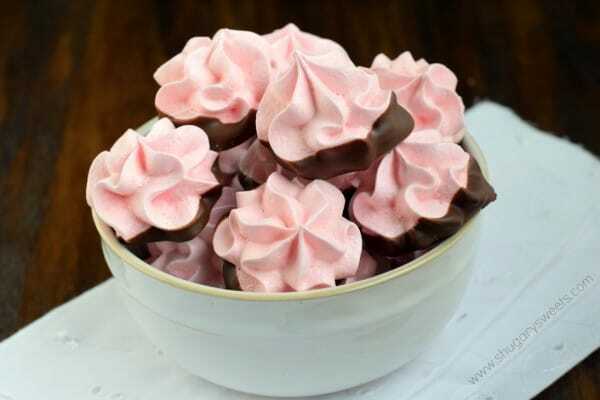 Delicious, festive, melt in your mouth Strawberry Meringues dipped in chocolate! 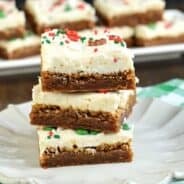 My favorite cookie recipe! Preheat oven to 200°F. Line two baking sheets with parchment paper. Set aside. In a clean, dry mixing bowl, whisk egg whites with electric mixer until foamy (about 30 seconds). Add in vinegar and corn starch and continue to beat for about a minute, as soft peaks begin to form. Slowly add in sugar while mixer is on high, and continue beating while adding in gelatin powder. Beat until stiff peaks form (about 4 minutes). Fill pastry bags with meringue and pipe onto the parchment paper in swirls (using your favorite tip). Place in oven and bake for 90 minutes. Turn oven off and leave in oven for several hours (or overnight. I prefer to make these in the evening and leave them in until morning. 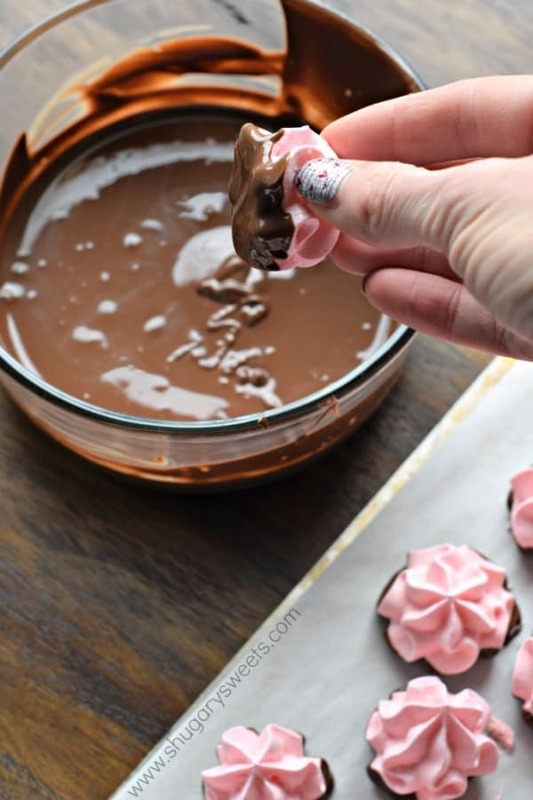 Once cooked, dip bottoms in melted chocolate. Allow to set, about 10 minutes. ENJOY! **I find these keep best in an open bowl or cookie jar, not covered. Do not bake if humid. Preach, Aimee. I’m a teacher and I work really hard, and I don’t think I’ll be getting an award (or wearing a beautiful dress) anytime soon. I hate how we idolize some professions and look down on others. It’s so arbitrary, too. These should get an award because they take skill and patience to make! They’re totally gorgeous. For starters, these are the most delish looking, bit size treats that just have me in awe!!!!! -Isn’t it crazy how the world perceives people these days.. It’s so sad and irritating! It seems like people just expect to get things handed to them or put on pedestals. Then you have the people that deserve those actual pedestals and they are never the ones placed on them. I can’t wait to make these cookies next week. My only concern is that I have 7 egg whites and if you’re getting over 100 cookies out of 4 egg whites I’d get almost double from 7 and I won’t be able to bake them in the oven at the same time. Were you able to fit all the cookies from 4 egg whites at once in the oven? For mine, I was able to fit them all onto two baking trays. It depends on your oven…I actually have three shelves in my oven, so I could have made another pan worth. Also, you can pipe these real close together as they don’t spread out (and the pans can be anywhere in the oven, as it’s not hot enough to burn them, although if you’re worried you can rotate the pans halfway through). You can also pipe them into higher swirls (like an icecream swirl)! These look delicious! Quick question….I was thinking of making these for my children’s classmates for their Valentine’s Day party. However, you recommend storing them in an open container. How would they do in a small ziplock bag for a short time? I would stick them in the bags probably the night before. Do you think the texture would change much from being in the baggies? Being in a ziploc overnight definitely could change the texture! My girls take them in their lunches and put them in ziplocs in the morning and they are fine by lunch (only a few hours). However, I would worry overnight might be too long. I’ve never tried gelatin powder coloring, will have to give it a shot. These cookies are beautiful and I think they would sweeten up any award show (or not, since I’m with you and don’t watch them) but they would be perfect for movie night at home! Love reading your angle on life…. and sweets ! Hollywood & Oscar’s ….. who doesn’t like getting a GOLD star in life? I’m a very active Pastor’s wife, I’ll be making these for our congregation for an after service treat. I’m so glad to have you here 🙂 Enjoy the recipe! These look great! I had a question about leaving them in the oven. When you say you turn the over off and leave them in there, do you take them out and let the oven completely cool down first or actually only turn the oven off and the meringues are okay to stay in there with the oven cooling. thanks in advanced for getting back to me! Hi, I tried making these beautiful cookies. When they came out of the oven, I left them out overnight and they looked perfect! Today, I tried picking them up to dip in the melted chocolate, they were soft and crumbled under my fingers. I wanted to take them to my daughters Adult Day Training for their Valentines party tomorrow, but they look awful. I’m so upset. What could have gone wrong. I followed your recipe to the T. I live in South Florida but we’ve been having cool weather and 0 humidity. I can send you a picture if you’d like. Thanks. I tried making these today and the mixture wouldn’t peak, it was white and smooth but watery. What could’ve gone wrong? My eggs were room temperature. I halved the recipe, could that have altered the chemistry? Sounds like it didn’t get beaten long enough. If there is any moisture or oils in the mixing bowl it can alter the results as well. Sorry! I know that If even just a small amount of egg yellow sneaks into the whites, they wont peak properly. No i don’t think so, it would change the texture. I have M size eggs. How many do i need?? Can I use a sugar substitute for the meringue for a diabetic? These look amazing! I can not wait to make these. I am always looking for a new baking challenge!! Which is your favorite jello flavor to use for this ? I love the strawberry. But lemon dipped in white chocolate is lovely too! A cake box will be perfect!! Thank you for the details!! I love the tip of using JELLO, that’s a game changer! 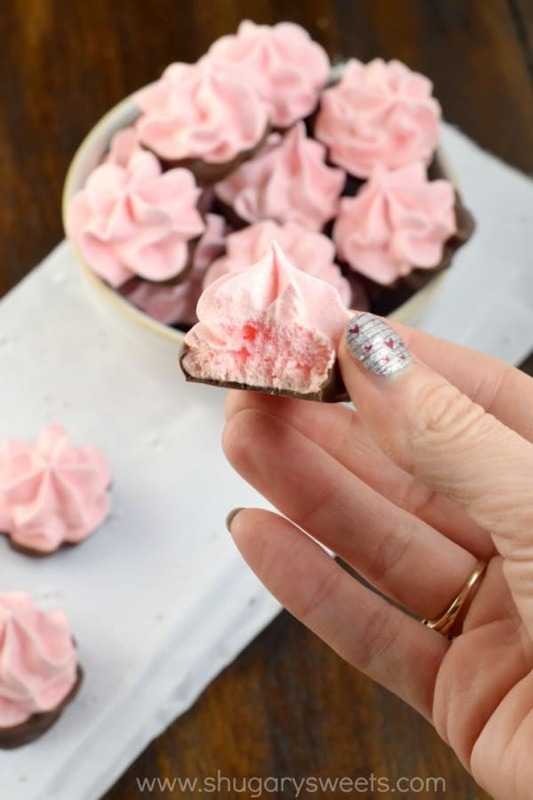 I love making these adorable meringue treats! They’re completely delicious and everyone loves them! So easy – and they always come out perfect! These look soo good! Definitely going to make them this week for Valentine’s Day! I’m so over the award shows too, not even sure the last time I watched one. But these yummy treats should definitely win an award! Perfection! Can you use pasteurized egg whites? Love these little treats! So light, fluffy and sweet! Your are so right on about this award show! Thank you for sharing your thoughts on them and for the great recipes! are they small enough to put 60 on a pan (or two)? Yes, it makes 60 LITTLE meringues. Usually on two pans!